All the paper gears which could fit onto the plastic sheets were arranged. The paper was then placed upside-down and spray with Super77 and allowed to dry. 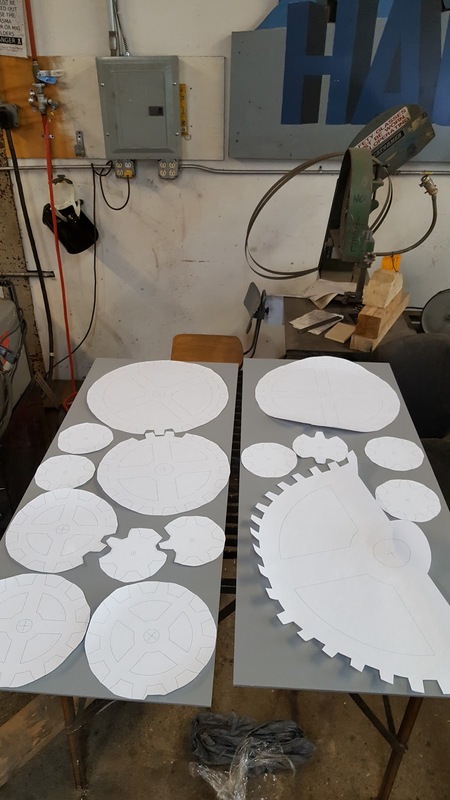 All the experimental seven and eight tooth gears, which were 100mm in diameter, were applied to the plastic sheets. The bandsaw used last time was abandoned in favor of a handheld jigsaw. This saw had a fresh blade and cut much faster and reliably. A suitable bandsaw with a sharp blade would still have been preferable. 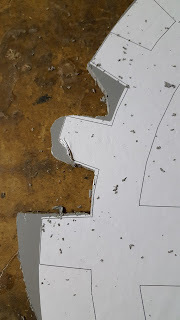 One thing I was worried about was the paper getting caught and crumpled under the jigsaw and this happened but infrequently and the teeth will still be easy to form as long as another gear can be placed over the tooth during forming. All the paper gears were cut out in a circle. The teeth were not formed yet. 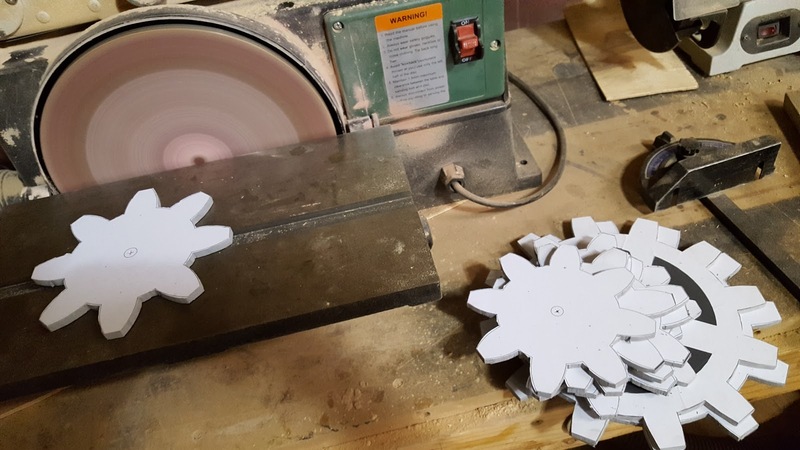 The same jigsaw was used to cut between the teeth and was also a better choice than the band saw with a dull blade. All the smallest gears had the space between the teeth cut out with the saw. This was four 7-tooth gears and four more 8-tooth gears as well as a 12-tooth gear. 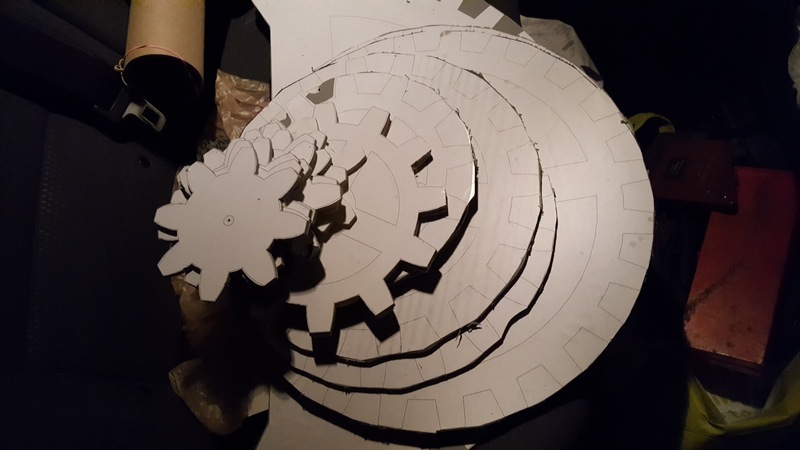 The smallest gears were done to ensure that a good technique could be found before experimenting with the large gears. 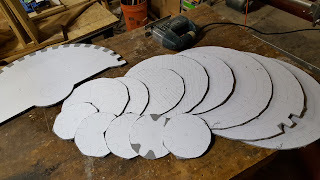 The flat end of each tooth was smoothed and finished on a circular sander. This sander ensured a straight edge at the end of each tooth and was fast. The sander could not be used between the teeth due to the size. The gears were gathered to leave for the night. The ones with cut teeth were ready to be sanded and the final form put on the teeth. The rest need to have the space between the teeth cut out. 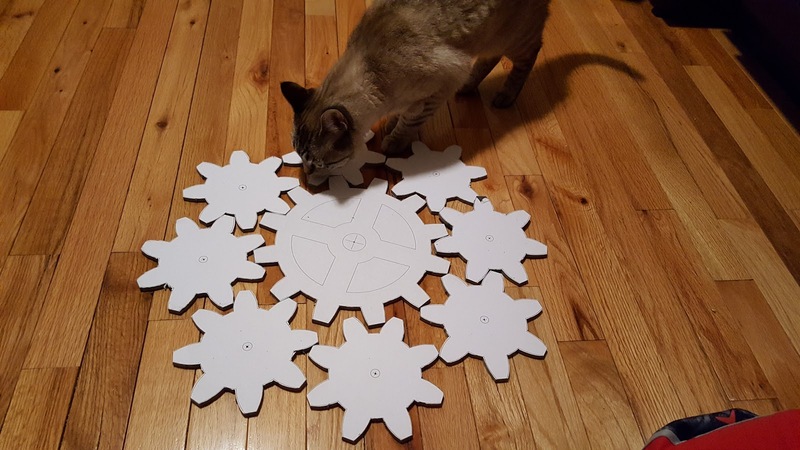 All the gears will need to have the spokes cut out but this may be waived in favor of attaching mirrors.